Look for gray tones, real or imitation wood flooring, leather upholstery and internet-connected appliances in the modern home. Spring has a way of motivating us to get things done. Our eyes open to new possibilities, and when we really look around our homes, we see some things have grown a bit shabby without our even noticing. Maybe the kitchen is outdated or the floors look worn. Maybe some hardworking appliances or furniture pieces deserve to be retired and replaced. Thankfully, our region is rich with excellent professionals who can provide solid guidance as we embark on our home’s spring tune-up. Perhaps the most ambitious project a homeowner can take on, any time of year, is a kitchen remodel. It’s expensive, inconvenient and requires you to make a lot of decisions. But it also may turn out to be the most rewarding project you could choose, both as a home investment and as a source of personal enjoyment. But the ROI in terms of personal enjoyment may be priceless. Feuillerat’s typical clients are nearing retirement and have no plans to sell their home anytime soon. “The kids are gone, the kitchen looks bad. They say, ‘Let’s do it so we can enjoy it,’” she says. Feuillerat sells cabinets and countertops, which make up about half the cost of a typical remodel. Labor is another major expense, so a job that requires removing walls and rearranging basic elements like plumbing and electrical sources is naturally going to cost more. She either works with your chosen contractor or recommends one she knows to be reliable. The price of a new kitchen floor greatly depends upon the material chosen; it can range from $3 to $6 per square foot. “But the labor cost is the same either way,” Feuillerat says. Unlike some major home projects – landscaping, for example – a kitchen remodel doesn’t lend itself well to being done in phases. For example, if you install new granite countertops on 30-year-old cabinets, the cabinets typically only look older. Then, when you want new cabinets it’s rather difficult to remove the granite tops with any guarantee they won’t break. The mess and inconvenience also inhibit some people from undertaking a kitchen remodel. Other people resist remodeling an outdated kitchen simply because they don’t know where to start. Feuillerat understands this feeling and is ready to help. You get what you pay for, and there’s a growing demand nationwide for better quality furniture, says Mitchell Johnson, store manager of the 6651 E. State St., Rockford, location of Gustafson’s Furniture & Mattress. Gustafson’s also has a store at 808 W. Riverside Blvd., in Rockford. “Both across the U.S. and here in our region, people are tired of cheap furniture that falls apart,” says Johnson. Gustafson’s offers items at every price point and has expanded higher-end lines like Bassett, Flexsteel, Daniel’s Amish, Bernhardt and Magnolia Home by Joanna Gaines to meet a growing demand for high-quality and highly fashionable furniture. When it comes to home fashion accessories, sunburst mirrors, fancy drawer pulls, gold inlay stripes on wood, and chandeliers mixed with rustic wood furniture styles are popular. “We’re seeing a lot of gold or silver accents for the home, a lot of bling in general,” says Gustafson. There’s also a movement toward nature-inspired accents, such as botanic tabletop arrangements, glass cloches and terrariums, bits of jute trim or animal prints. And florals are making a comeback in some textiles, although they’re not your grandmother’s florals. Johnson reports that leather still reigns supreme in upholstered furniture. “Be sure to ask questions about leather quality, since there are many imitations on the market,” he advises. Protected leather is your best bet if pets will be on your furniture. “We sell a lot of leather but we also sell a lot of fabric sofas,” he adds. “There’s a trend toward more texture, with tweeds and corduroys and weaves. Today’s upholstery options are really wonderful – very durable but beautiful and comfortable.” Most of today’s upholstery fabrics are made from PET, a highly durable polyester thread. Gustafson is impressed by the new motion-control headrests that allow you to achieve exactly the right position. “Especially when you’re sitting for a long time, watching TV or whatever you’re doing, it’s very nice to be able to position your head as well as your legs and back just the way you want them,” she says. When buying upholstered furniture, the important question is not how the surface looks but what lies beneath. Perhaps the spring project you most need to tackle is replacing those worn-out floors. Floors account for a great deal of surface area in your home so they greatly impact your home’s look and feel. Fortunately, there’s a dazzling array of flooring options that are both attractive and durable. “It’s pretty amazing how the flooring industry just keeps evolving and coming up with better products,” says Bruce Swanson, owner of Swanson Floor Coverings, 4400 Maray Drive, Rockford. Carpet, tile, wood and new luxury vinyl tiles (LVT) each have unique advantages. While U.S. carpet sales have waned in favor of hard-surface flooring, don’t count carpet out, says Swanson. He still sells a lot of it here in the chilly Midwest. “Today’s carpet fibers are very soft to the touch and very durable,” he says. Many people still prefer the feel of it under their feet, especially in bedrooms and living rooms. Two-tone Saxony carpets are attractive and practical, says Swanson, since they camouflage wear and provide a plush feel. And carpets with subtle patterns in them have made a return. Often the pattern is more about texture than color, in step with a general home fashion trend that emphasizes texture. The flooring type that has seen a steady rise for many decades now is wood – whether solid wood, engineered wood or a man-made copycat. “People love the wood look, whether it’s real wood or another material made to look like wood,” says Swanson. He sells a lot of three-quarter inch solid oak hardwood, but also engineered wood and wood-look luxury vinyl tile (LVT), especially for basements and bathrooms, where solid wood isn’t recommended because of potential moisture damage. Wood floors in wider plank widths are common today, too. Swanson is a big fan of new LVT flooring, a man-made product that looks remarkably like wood or natural stone, thanks to the precision of digital photography. 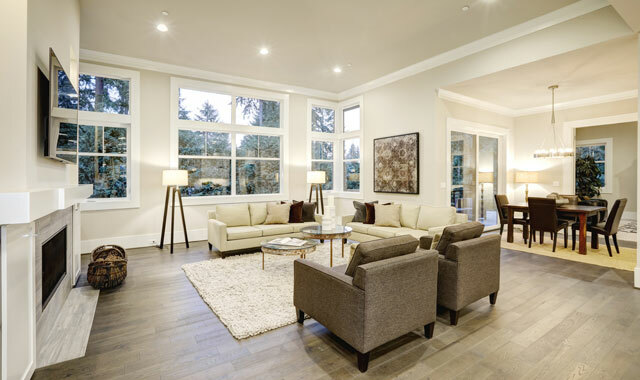 For some upscale homeowners, radiant heat under hard-surface flooring is a must-have guilty pleasure. Tile flooring is still a favorite in bathrooms, and there’s a trend toward extending the same tile right into a walk-in shower. Ceramic and porcelain tile come in a huge variety of looks. When it comes to the smooth running of a household, appliances are workhorses that need to be dependable and efficient, says Darwyn Guler, owner of Guler Appliance Co., 227 Seventh St., Rockford. These days, a dependable appliance may also mean an internet connection. “Brands like GE Appliances have a policy of continuous improvement and innovation,” says Guler. Keeping up with the times has led many appliance manufacturers to introduce new conveniences that tap into the wired home. Appliances equipped with Bluetooth-capable systems can sync clocks, lights, fans and heating sources, and if equipped with Wi-Fi, these modern appliances can enable someone to remotely monitor their appliances from a smartphone. Not sure if an appliance is Bluetooth or Wi-Fi capable? Check for special icons and labels on the unit, says Guler. On display at Guler Appliance are plenty of white, black and stainless steel appliances – tones that go with just about any decor. The newest color on the block is a slate finish. General Electric’s Slate, released a few years ago, received an almost 75 percent approval rating for cleanability and appearance. It’s a warm, low-gloss gray that goes well with most cabinet and countertop colors. “Probably five out of every 10 customers here are buying the slate finish,” says Guler. A lot of design thought can go into a newly remodeled kitchen or laundry room. Today’s upscale homeowners often choose professional-grade appliances such as products by Wolf, Sub-Zero and GE Monogram – all of which Guler Appliance sells and services. “When buying washers and dryers, homeowners are now shopping for dependability and longevity,” says Guler. “Simple, easy-to-use controls are in high demand.” Guler points out that Speed Queen washers and dryers are manufactured in Ripon, Wis. The products made by this century-old manufacturer come with longer warranties, says Guler, and these products can last 25 years. Speed Queen offers another advantage, too – it’s family-owned and -operated. Guler, whose business has served the Rockford area since 1929, appreciates the way that choosing home-grown products benefits the local economy. This entry was posted on Thursday, March 30th, 2017 at 12:00 pm	and is filed under Annual Guide, Home & Garden, Top Posts. You can follow any responses to this entry through the RSS 2.0 feed. Both comments and pings are currently closed.